Winamp is a famous media player for Windows, Mac, and Android devices. The player was 1st released on the 21st of April 1997 by Justin Frankel and Dmitry Boldyrev. The name Winamp is a combination of two words – Windows and AMP (Advanced multimedia products). At first, it came with a minimalistic set of options, and it was windowless. You could only see a menu bar with play, stop, pause, and unpause features. The 2nd version of Winamp (Winamp 0.92) was released as freeware in May 1997. This time it came with GUI that resembled the standard dark-gray Winamp interface. On the 7th of June in the same year, there was released one more version of Winamp. There was added spectrum analyzer and color-changing volume slider. Finally, on the 8th of September 1998, there was released Winamp 2 – a fully functional player for audio files. Besides that, there was released a website where users could download various plug-ins to expand their music listening experience, skins to make the software look unique and suit the desktop wallpaper, multiple tracks and developers resources for downloading. By the 20th of June 2000, Winamp got 25 million downloads. In December 2010 there was launched the 1st Android version of the famous software followed by the Mac version that was released in October 2011. Unfortunately, the project even been so popular was closed on December 20, 2013. The mobile app was removed from the Play Store in 2014. The new Music Box version comes out with the long-awaited option to import playlists from Winamp, Windows Media Player, VLC Media Player, AIMP, Zoom, Zune, KMPlayer, Foobar2000, etc. 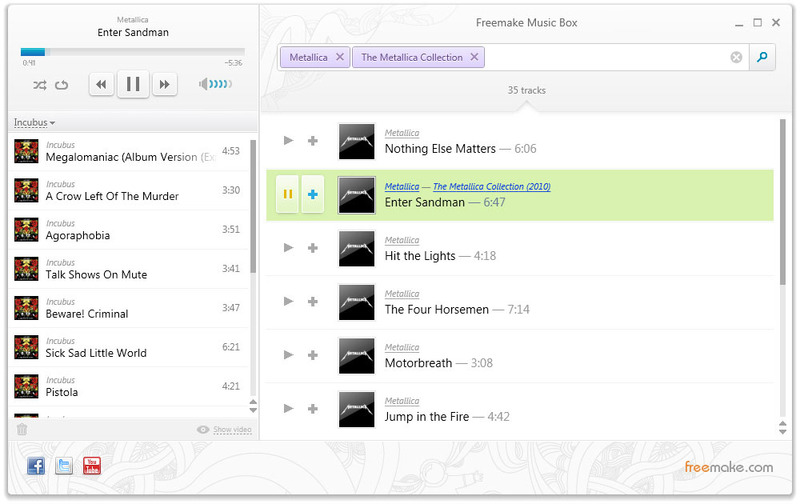 Thus, users can easily add the list of their favorite songs, regardless whether they still exist on a PC or not - Freemake Music Box will find and stream them from the Web. The supported playlist formats are M3U, M3U8, ASX, TPL, KPL, WPL, AIMPPL, PLC, PLS, RLC, ZPL, XSPT, SMI, SMIL. 1) Download and run Freemake Music Box. Keep in mind that the software can be fully used on PCs and laptops running Windows (Win Server is not supported). 4) Click "OK" to add a playlist to Freemake Music Box. Now you need to only click the Play button to start listening to your tracks. There is no need to keep multiple players anymore. You can add a playlist from all popular players to Freemake Music Box and have all your music collection within one tool. Even if you delete the unnecessary utility from your PC, the playlists will be securely saved in Freemake. You might even delete the music tracks to get more space on your PC. Freemake software will find the necessary track online and will stream it when you want to listen to it. Do not hesitate to contact us in case you have questions concerning the new functionality of Freemake Music Box.